Medicine, Health, & Healthcare; Gender, Gender Identity, & Sexuality; Inequality; Science, Knoweldge, & Technology; Race & Ethnicity; Organizations; Stress; Family. Emily is a PhD candidate in the Department of Sociology studying how gender and sexuality shape health and well-being through social institutions, such as medicine and the family. Emily’s findings are published (or forthcoming) in Social Science & Medicine, Journal of Marriage and Family, and Sociology Compass. 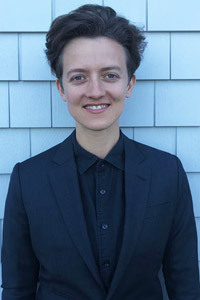 Specifically, Emily is working to: examine how diverse medical actors are shaping ideas about gender and sexuality; explain how these ideas are employed in healthcare contexts, structuring the ways LGBTQ people experience health and healthcare; identify current barriers to care for LGBTQ people; and compare health experiences of LGBTQ and straight individuals and couples. Emily’s dissertation study triangulates original data from interviews with diverse LGBTQ patients and providers as well as ethnographic fieldwork at an LGBT healthcare organization to reveal how individual and organizational factors shape healthcare for multiply marginalized LGBTQ individuals at high risk of poor health and underutilization of care. This project is supported by the National Science Foundation, CLAGS: Center for LGBTQ Studies, and the Urban Ethnography Lab at University of Texas-Austin. At UT, Emily has worked as a research assistant for: Dr. Debra Umberson's Health and Relationships Project, funded by the National Institute for Aging; the related Massachusetts Health and Relationships Project, funded by the Robert Wood Johnson Foundation; and Dr. David Pedulla's project examining "Non-Standard, Contingent, and Precarious Work in the 'New Economy'" (funded by UC-Davis Center for Poverty Research). Additionally, Emily was the project coordinator for the "Texas Dyadic Diabetes Study: Diabetes Management in Lation, White, and Black Couples" (PI: Dr. Tetyana Pudrovska). Emily consults on additional research studies as well. What role do social processes play in determining health and well-being? How do social institutions, policies, and categories matter for the health of different populations in the United States? This course will broadly introduce you to a sociological perspective of health and well-being, which emphasizes how social inequality, institutions, policies, relationships, and power shape health. We will examine health disparities by race/ethnicity, gender and gender identity, sexuality, socioeconomic status, and nativity using intersectional, sociological frameworks. Additionally, students will learn how health outcomes, policies, and systems in the U.S. compare to those in other wealthy nations. Finally, we will review the ways health and illness are socially constructed, how power and authority operate within medicine, and how social movements inform conversations about health and healthcare in the U.S. This semester, we will ground our exploration of sociological health literatures with a focus on racial health disparities in the U.S. Together, we will connect course materials that address the macro, meso, and micro processes through which inequality shapes health to current events and public discourse. We will read discussions of current events—for example, Charlottesville and Black Lives Matter—alongside scholarly texts. By the end of the semester, students will be able to 1) explain how social factors shape health and well-being and 2) critique and analyze health-related public discourse using sociological frameworks. Course goals will be assessed by student performance on three short-answer essay exams, a final project in which students will write a paper analyzing a popular text from a sociological perspective, and participation. Participation—broadly defined—is key to success in this course. Student participation will be evaluated through class attendance, performance on pop quizzes, and engagement in learning activities. Pop quizzes will assess whether or not students have completed assigned readings. For learning activities, students will locate news articles relevant to course concepts and share them with the class through Canvas. These materials will inform in-class discussions and exercises. Finally, throughout the semester, we will use social media platforms to share questions and insights about course materials as well as current events related to course concepts. Students are responsible for reading and reviewing assigned materials before each class. For this course, materials will be made up of scholarly articles and chapters, video talks and documentaries, as well as news and popular essays, which will be available through Canvas. There are no required books for this course. In addition to readings, students are responsible for attending class lectures and taking part in learning activities. Attendance is mandatory; students are allowed two absences, for any reason. Except in verifiable, extenuating circumstances (documented illness or emergency), no make-up exams will be given, no late final essays will be accepted, and no additional absences will be excused. In the case of scheduling conflicts or illness, students must let me know in advance of the scheduled exam date. Likewise, after two absences, students must alert me of absence due to (documentable) illness or emergency before class begins. There will be no final exam in this course.